Srinagar, Aug 15: Normal life came to a grinding halt as shop and business establishments were closed and traffic was off the road in Kashmir Valley due to strike called by separatists on Independence Day. Meanwhile, there were no restrictions imposed in any part of the valley though all roads leading to venues were ID functions were held were closed with barbed wires and only people with valid ID cards were allowed to move in these areas. Train service was suspended for security reasons in the valley, where mobile services were also barred for about four hours. The mobile services, including internet, were restored after the completion of the Independence Day function. Shops and business establishments were closed and traffic was off the road in civil lines and uptown Srinagar, where hundreds of security force personnel, wearing bullet proof jackets and holding weapons and lathis in their hands, were seen patrolling the streets to prevent any untoward incident. Business and other activities remained crippled in main business hubs of the city, including Budshah Chowk, Regal Chowk, Maisuma, Hari Singh High Street (HSHS), Batmaloo, Moulana Azad Road, Residency Road and Dalgate. Even though there were no restrictions in downtown and Shehar-e-Khas (SeK) on Independence Day, shops and business establishments were closed and traffic was off the road in support of the strike. For the first time after about two decades, no restrictions were imposed in downtown and SeK on Independence day. Authorities used to impose curfew like restrictions on this day every years in many parts of the city on Independence and Republic Day. Joint Resistance Leadership (JRL), comprising of Syed Ali Shah Geelani, Mirwaiz Moulvi Omar Farooq and Mohammad Yasin Malik, had called for a strike on Independence Day. 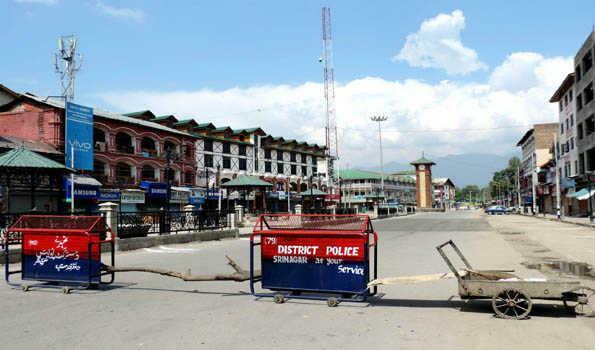 Hundreds of security forces and State police personnel were deployed in major towns and tehsil headquarters to maintain law and order, said a report from south Kashmir, where business and other activities were crippled in support of the strike called by separatists. Security has been stepped up along the Srinagar-Jammu national highway to prevent any protests. But, authorities have suspended Amarnath yatra movement on Srinagar-Jammu national highway since August 13 due to security reasons. A report from Bandipora said life was crippled in this and other north Kashmir towns and tehsil headquarters, where shops were closed and traffic was off the road in support of the strike. Additional security forces had been deployed in entire north Kashmir to prevent any law and order problem. Normal life was also crippled in twin central Kashmir districts of Ganderbal and Budgam in support of the strike call.